Garnet contains a wealth of information about the pressure, temperature, and time of metamorphism. 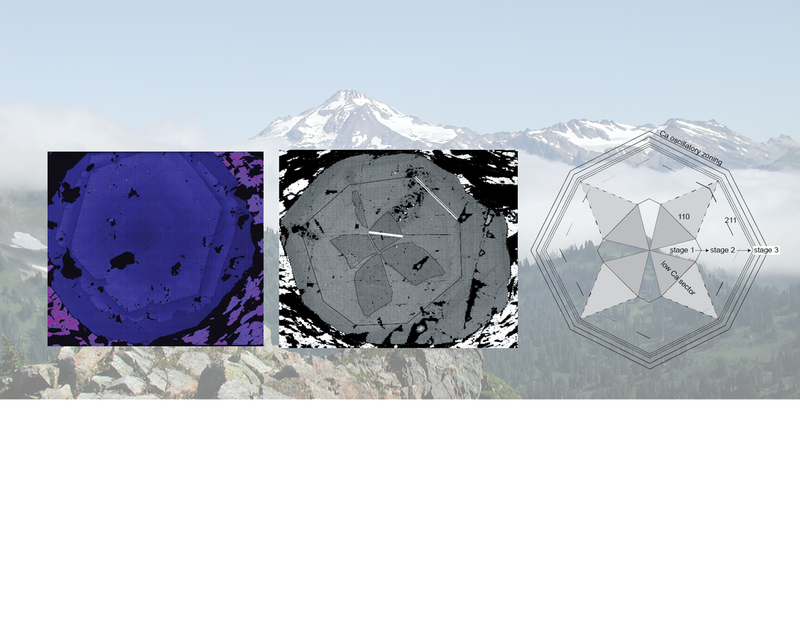 A fraction of this information has been tapped by Stowell and students in order to elucidate the nature and timing of metamorphism in the North Cascades Crystalline Core of Washington State. Initial research focussed on P-T-t paths for metamorphism in the Nason terrane. This was subsequently extended into the Swakane Gneiss. The new quantitative P-T-t paths, based on isochemical phase diagram sections (pseudosections) and garnet Sm-Nd ages, indicate that garnet in the Nason terrane grew after the majority of plutons were emplaced and the spatial distribution of ages and pressure estimates are compatible with thrust loading. Some of the garnet from these rocks contain distinct compositional sector zones that clearly indicate the changes in crystal morphology during growth.